After our cool, shady hike through the canyon on the Grandstaff Trail, we thought we were ready to take on a bigger challenge. We were wrong! 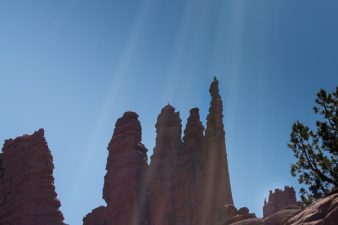 We return to Fisher Towers to test our endurance (we failed) and to hopefully see climbers on top of the towers (we did!). *Check out Captain Morgan and Rufus by clicking here. You sure are seeing a lot of new and interesting places this year Debbie and Charlie. I know the next trail will be just right for you all to hike. You probably did more than Dean and I could have. The Fisher Towers Trail does look like a neat place to see. It is neat especially when there are lots of folks at the top crawling all over! Looks like you two are in GREAT shape and thoroughly enjoying retirement!! We are truly enjoying your blog. Keep up the good work. I can’t wait to explore some of these places. You would not think we are in good shape if you had heard us gasping for breath on that trail :-)!! The only difference between a rut and a grave…is in their dimensions.